Argosy Minerals Limited (ASX:AGY) is listed on the Australian Securities Exchange. The company’s lithium hydroxide exceeded battery-grade standard in lab tests and may provide a complementary production strategy. Argosy Minerals Limited (ASX: AGY) is an Australian company, listed on the Australian Securities Exchange (ASX:AGY), with a current 77.5% interest in the Rincon Lithium Project in Salta Province, Argentina. 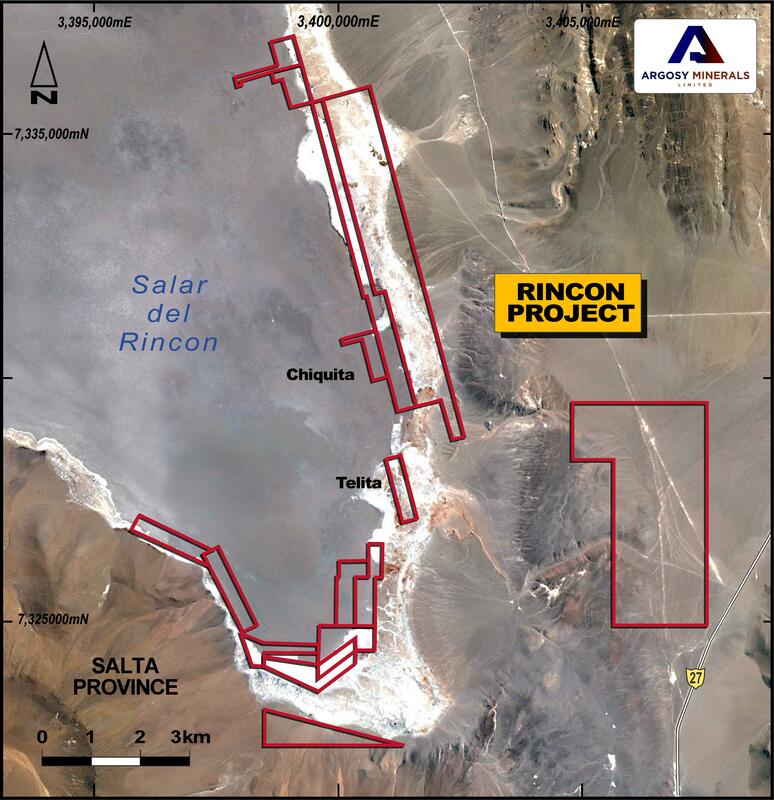 The Rincon Lithium Project currently comprises up to ~2,572 hectares of Mining Titles within the Salar del Rincon in Salta Province, Argentina. Argosy currently has a 77.5% interest in the JV entity that owns Rincon Lithium Project - Puna Mining S.A., with the right to move to 90% ownership in consideration for funding Stage 3 development. The Project is located in the elevated and arid Puna region of Argentina and forms part of a number of highly mineralised salars in production and development. Geological studies within the Salar del Rincon show historical sample values that are promising for further studies to determine a potential development perspective. Historical data and records within the Rincon Project have been investigated by Mr Alurralde and will be used to assist with the Company’s works programs, however no feasibility studies have been completed within the Project area. The Project area is serviced by high quality infrastructure including access via all-seasons roads, electrical power, a terminus for a natural gas pipeline and road and railway to Antofagasta port facilities in Chile. Alex is an experienced resources industry executive. Alex currently serves as CEO of uranium producer, Paladin Energy Limited (ASX:PDN). He is also Non-Executive Chairman of Azarga Metals Corp. (TSX-V:AZR) and Non-Executive Director of Metalla Royalty & STreaming (TSX:MTR). He was previously CEO of SouthGobi Resources, an Ivanhoe Mines Group company, and a Non-Executive Director of Goldrock Mines Corp. Prior to his 10-year executive career in mining, Alex had a 10-year+ career as a natural resources investment banker, including as Managing Director, Head of Metals and Mining Investment Banking, Asia for Citigroup. Alex holds a Bachelor degree in Economics from Monash University in Australia. Jerko is a Chartered Professional Geologist having spent over 20 years in the mining and resources industry. Jerko has held executive management roles for private and public resources companies, with operational and corporate experience in various commodities covering exploration, project development, business development, finance, commercial and corporate activities involved with projects in Australia, Asia, Africa and South America. Jerko has considerable experience in building junior resources companies and understands the requirements working within this sector, including fundamental parameters, strategic drivers and market requirements within the junior resources industry. He played a key role in transforming Kangaroo Resources Ltd to an ASX300 company taken over by Bayan Resources. Other executive roles have included Managing Director at Indicoal Mining Australia, Technical Director at OZ Coal, General Manager at Strike Resources and Alara Resources, and Chief Geologist at Fireside Resources. Jerko is currently a director of ASX listed Discovery Africa Limited. He is a Chartered Professional (Geology) Member of the Australasian Institute of Mining and Metallurgy and holds a Bachelor of Science in Applied Geology from Curtin University in Western Australia. Mr Matic is a Chartered Accountant with over 25 years experience in the areas of financial and executive management, accounting, audit, business and corporate advisory. Mr Matic is a director of a chartered accounting firm and a corporate advisory company based in Perth, and has specialist expertise and exposure in areas of audit, corporate services, due diligence, mergers and acquisitions, and valuations. Mr Matic is currently a director of several ASX listed companies including Valmec Ltd (since 6 February 2012), Celsius Coal Ltd (since 23 December 2012), Argosy Minerals Limited (since 17 July 2014) and Antilles Oil and Gas NL (since 12 February 2016). Mr Matic has also acted as Chief Financial Officer and Company Secretary for companies in the private and public sector and currently holds several CFO and company secretarial roles with publicly listed companies. Mr Randall holds a Bachelor of Applied Chemistry and has more than 45 years' of extensive experience in corporate, management and marketing in the resources sector, including more than 25 years with the Rio Tinto group of companies. His experience has covered a diverse range of commodities including potash (brine), iron ore, base metals, uranium, mineral sands and coal. He has a proven track record in managing and supporting financial and corporate activities and this experience has afforded him significant exposure to the investment, broking and analyst community. Mr Randall has held the position of chairman and director of a number of ASX listed companies, with currrent directorships including Kalium Lakes Limited, Thundelarra Limited, Summit Resources Limited and Magnetite Mines. Past directorships include Consolidated Minerals Limited, Titan Resources Limited, Northern Mining Limited, Iron Ore Holdings Limited, United Minerals Corporation NL and MZI Resources Limited. Andrea is an accounting and corporate governance professional with over 18 years experience in accounting, corporate governance, finance and corporate banking. She has a Bachelor of Commerce, Graduate Diploma in Corporate Governance, Graduate Diploma in Applied Finance and Investment and a Masters of Business Administration. Andrea Betti has acted as Chief Financial Officer and Assistant Company Secretary for companies in the private and public sector, as well as senior executive roles in the banking and finance industry.